HB HBB MAGIC HIGH DENSITY Luau Table Skirt are made of plastic, it comes with silk hibiscus flowers on it and separate 12 pcs palm leaves. 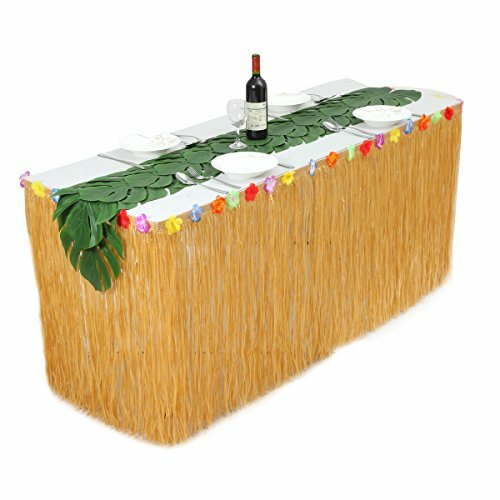 The palm leaves can be used as place mat or connected by dot glue (the package included) to make a table runner, which is perfect for luau party decoration. The Luau Table skirt is 9 ft length by 30 inches height, normally it can cover 3 sides of 6 ft table. If you want to cover 4 sides or your table size is bigger, you can order more pcs to make the effect as you want. Buy Now and receive HBB Global 100% Money-Back Guarantee! We offer a 90 day no-questions-asked refund policy. HBB Global is an U.S seller who takes great pride in exceptional customer service!Buy from us with ease, fast shipping, confidence and no hassle return! This luau table skirt are perfect decoration for hawaiian,luau,tiki and beach party! SIZE: 9ft length by 30 inches height, can cover 3 sides of 6 ft table.If you want to cover 4 sides or your table is bigger, you can order more pcs . 12pcs artificial palm leaves can be connected by spot adhesives (included in package) and used as a table runner or place mat. FAST AND EASY SETUP: Each Grass Skirt comes with hook&loop(back side with adhesive) for easy attachment to your table or other surface. 100% SATISFACTION GUARANTEE- If you are not satisfied with our Hawaiian table skirt, you will receive your money back.